This young healthcare REIT is in a difficult niche, but it's doing a solid job of growing its business just the same. Is it worth buying? Many healthcare real estate investment trusts, or REITs, have been having a hard time of it lately, with overbuilding in private-pay senior housing assets and government payment and regulatory issues in the nursing home space. The second issue has been a notable headwind for CareTrust REIT Inc. (NASDAQ:CTRE), which is heavily tilted toward nursing homes. However, this relatively young healthcare property owner has been doing an excellent job of finding value in a tough market. Is it worth buying? CareTrust REIT was spun off from healthcare provider The Ensign Group in mid-2014. CareTrust basically took all of the real estate, allowing Ensign to become a pure-play healthcare operator. The problem with this deal is that it left CareTrust with a single tenant operating all of its 94 facilities. From day one the goal was to expand via acquisition, with the express purpose of diversifying its operator exposure -- a typical approach for a spin off situation like this. CareTrust has made a lot of progress. In the second half of 2014 it bought five properties before really ramping up in 2015, 2016, and 2017, when it acquired 20, 35, and 36 assets, respectively. There was a bit of a slowdown in 2018, with only 12 deals. But at this point the REIT has around 190 properties across 25 states, effectively doubling its size in less than five years. The Ensign Group now accounts for around 40% of CareTrust's rent roll -- still a notable sum, but much less than the exposure at the IPO. The portfolio today is spread across three sectors: skilled nursing (73% of rents), multi-service campuses (13%), and senior housing (14%). Skilled nursing is clearly the biggest component of the business and a continued focus of its investments. This healthcare property niche has been one of the most troubled sectors of the industry, with payment issues resulting in larger healthcare REITs like Ventas and HCP, Inc. spinning off assets to avoid the problems facing nursing home operators. That's clearly not a good sign; however, the long-term medical need for nursing home care is pretty clear, and will benefit from the same aging population that is expected to lift demand for assisted living and well living facilities. Moreover, being an acquirer when others are looking to sell has resulted in pretty good investment opportunities for CareTrust, which estimates that it has been able to buy assets with an average 9% initial yield -- a robust figure in the REIT space today. Check out the latest CareTrust REIT earnings call transcript. As a relatively young REIT, CareTrust moved quickly to tap the capital markets via debt issuance and stock sales to fund its growth. The portfolio expansion has also allowed it to diversify and, equally important, increase its dividend every year since its IPO. In 2014 the quarterly dividend was $0.125 per share. The most recent quarterly dividend, paid throughout 2018, was $0.205 per share, up 10% over the quarterly dividends paid in 2017. CTRE Total Long Term Debt (Quarterly) data by YCharts. 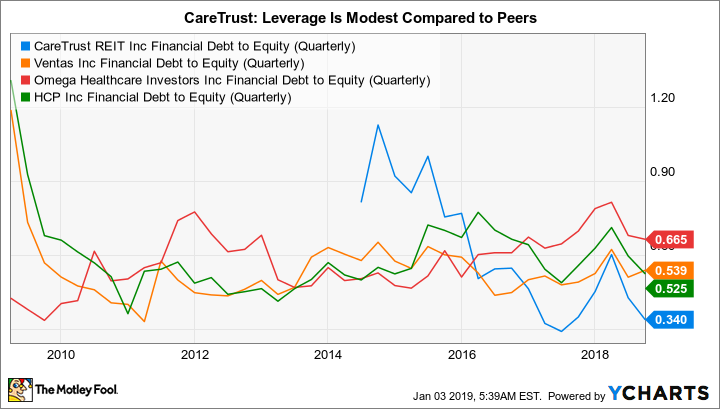 At this point CareTrust's leverage is modest compared to that of peers, so debt remains a viable alternative for funding growth. The stock price, meanwhile, is hovering around the IPO price, suggesting that equity sales also remain a source of expansion capital. And CareTrust is still small enough that a modest acquisition pace can have a material impact on its growth. CTRE Financial Debt to Equity (Quarterly) data by YCharts. Growth is really the key factor here, since the yield is just 4.3%. That's pretty modest for an asset class specifically designed to throw off income for shareholders. For comparison, Omega Healthcare Investors, one of the largest players in the nursing home sector, has a 7.5% yield. CareTrust is basically a growth REIT, with the market likely expecting continued portfolio expansion and robust dividend growth. Looking at valuation in another way, as Motley Fool's Jim Royal recently noted, CareTrust is trading toward the higher end of its valuation range at around 15 times funds from operations. That suggests that investors are paying a full price here. There's nothing inherently wrong with CareTrust REIT. It has been using a well-worn playbook for REIT spinoffs, and so far it has been doing a pretty good job taking advantage of a weak nursing home market to get attractive pricing on its diversifying acquisitions. 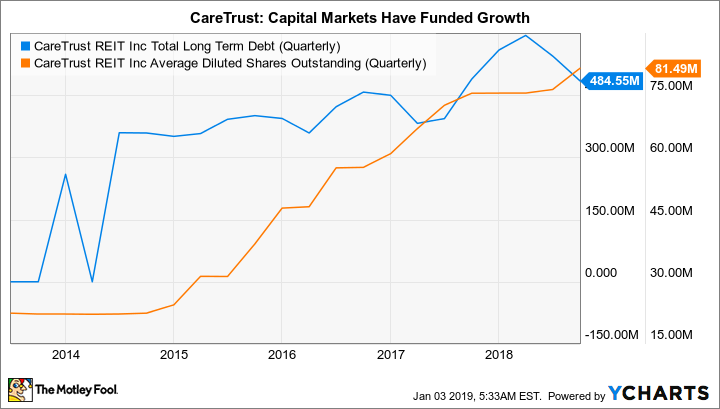 If you are looking for a REIT that is focused on growth, including dividend growth, then CareTrust is worth a deep dive. But don't go in thinking you are getting a great deal. It's hard to suggest that a REIT with a yield of 4.4% is a buy. The asset class is designed to generate income, and CareTrust REIT's yield is just too low to live up to that expectation (note that investors pay full tax rates on REIT dividends since REITs don't pay corporate taxes). Its elevated price-to-FFO valuation backs that assessment up in a slightly different way. The yield issue is especially problematic when companies with decades of dividend history behind them, like AT&T, Altria, and ExxonMobil, offer similar or higher yields -- not to mention competitors in the same healthcare niche, like Omega. Income-focused investors have plenty of alternatives.